Seasonal furnace maintenance is essential to make sure your furnace is running efficiently and safely. Just like today's automobiles, modern furnace and air conditioning systems contain motors, sensors, and intricate control mechanisms that need seasonal attention, tuning, and preventative maintenance. In order to keep your equipment running in tip-top running condition, schedule your Furnace test-and-tune before it turns cold. Last year we received over 250 calls for emergency service when he weather turned cold. Don't take a chance this year to need an emergency repair on Thanksgiving or Christmas eve! Our normal price for a test-and tune with an air quality analysis and combustion gas leak detections is $140. If you plan ahead, we are offering a pre-season special of only $89. And, if you are a Sandium Service Club member, the charge is only $75. In most cases the Sandium Test-and-Tune will pay for itself in utility savings. But mostly, the peace of mind you will have knowing your system is operating safely is truely priceless. We are looking forward to assisting you. 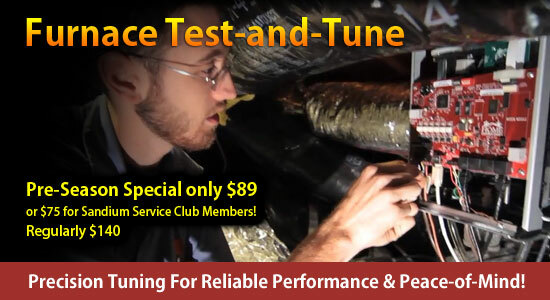 BONUS OFFER: Mention the web special get a Duct Leakage Test, normally $150, for only $99 with a Furnace Test-and-Tune. Heating systems are often a long term investment and you would want to take good care of them to ensure that they serve you for years. Cera therm company offering an high quality induction melting furnaces are reputed for low power consumption, superior productivity by adopting advanced technology, operational safety and simple installation..